Hi, I am interested in your 1974 GMC Suburban (stock #CTP2355.1) listed on Autotrader for $18,900. I'd like to get more information about this vehicle and confirm its availability. 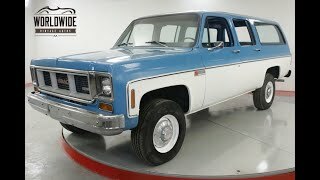 Worldwide Vintage Autos is pleased to present this 1974 GMC Suburban. Opportunities like this do not come about very often. This is your chance to own a, collector grade, 4x4 Suburban with one owner, 17K, pampered miles. Purchased new, garage kept, and driven seldom. Owners manual. The Chevrolet Suburban is a full-size SUV from Chevrolet. It is the longest continuous use automobile nameplate in production, starting in 1935 for the 1935 U.S. model year, and has traditionally been one of General Motors most profitable vehicles. The 1935 first generation Carryall Suburban was one of the first production all-metal bodied station wagons. -GM 350 V8. 17K Original miles per original owner. We would love to meet you in person and encourage you to come see the vehicles before you buy!